The all-steel large formwork is mainly known as different types like assembled, integral, and the overall reserved door-hole type. The assembled all-steel large formwork consists of multiple unit plates. Before construction, it needs to be pre-assembled according to the requirements of the board drawing, but the versatility is better, and the design and production of the board are convenient. 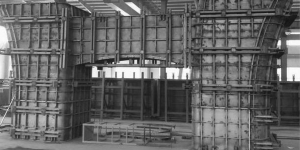 The integral all-steel large formwork is produced by the manufacturer according to the plate drawing. It is not necessary to set up before use, but the versatility is not good, and the design and production of the plate are inconvenient. 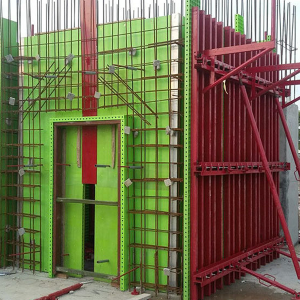 The door-and-hole all-steel large formwork is reserved, and the door and window openings are convenient to construct, but the formwork is more fragmented, using much more times of tower cranes, and the versatility is poor. The following mainly introduces the assembled all-steel large formwork. Each assembled large formwork is composed of several standard modular unit boards (plus non-standard unit boards). The standard modular unit board specifications are 1500mm, 1200mm, 900mm, 600mm.300mm. To ensure the rigidity of the large forms, the panel is made of 0-6mm steel plate, steel grade: Q235. The main rib is made of 80 channel steel, the spacing is not more than 300mm, the edge rib is made of special 80mm steel, the main back rib is paired 10 channel steel, and the longitudinal direction is set three ribs. Inner and outer wall formwork is correspondingly arranged with three rows of pull bolts, and the horizontal spacing is not more than 1200mm. The large formwork is supported by the support of the base plate, and the verticality of the large formwork is adjusted by the base plate. The principle of the base plate arrangement is 1000-2000 mm, 2000-5000 mm, 5000 mm or more, but the exact number of base plate is determined by the calculation in combination with the drawings. In case of the narrower space when the base plate can not be installed and used, then the base plate are not configured. When the distance of tie rod holes on the adjacent group of formwork plate is greater than 300mm, then using 400mm long small back reinforcement bars to form a whole system. a) The construction speed is fast: the installation of a shearing wall formwork of a unit (80㎡) can be completed in about 1 day, which saves more than half of the construction time compared with the traditional formwork system, and reduces the construction time cost accordingly. 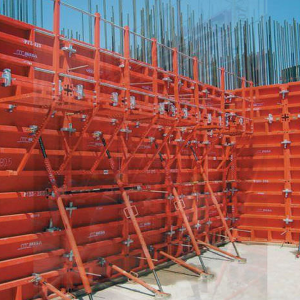 b) High construction efficiency: Complete a unit of shearing wall formwork for 20-30 days, compared with the traditional formwork system, the construction efficiency is improved by 200%~300%, saving labor costs. c) The effect of the finished concrete is better: the concrete structure of shearing wall made by all-steel large formwork has a good perception. According to the national concrete acceptance standard, the geometrical dimensions, verticality and surface flatness of the concrete are tested. The grid rate is over 95%. The finished wall can be used for decorative without plastering, eliminating the need for traditional plastering operations, reducing the number of processes and shortening the construction time. It not only improves the quality of the project, but also reduces the project cost, saves resources, reduces construction waste, and has good economic and social benefits. d) Much more turnover: according to the usage situation in Beijing area, it can be rotated 500-800. In the process of use, it is only necessary to clean the surface and apply the release agent in time. Under normal circumstances, no special maintenance correction is needed. Maintenance cost is low. 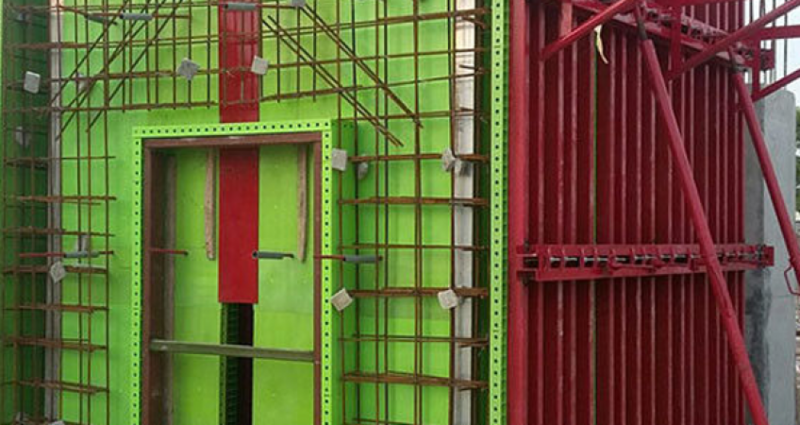 Compared with the traditional formwork system, the one-time investment is larger but the cost amortization is lower.